← Cheap way to add SMS to a Linux PC or microcontroller or Arduino etc. Back in June of this year (2012) I responded to a post by “skyking” on the OpenIPCam.com forum. Skyking was experiencing the same issue as me that rendered useless the motion detection feature with a camera equipped with integral InfraRed (IR) lights, when installed outdoors. When I attempted to use my waterproof Foscam FI8904W camera outdoors to capture photos of bears at night, the motion of bugs attracted to the IR lights caused images to be constantly mailed to me. Reducing sensitivity didn’t help because, up close, the bugs are huge to the camera’s sensor. While the 850nm IR lights are invisible to humans, except for a very faint reddish glow, moths and other insects apparently see them clearly and are attracted to the IR lights in the same way that they are attracted to an ordinary light bulb. The issue is how to extinguish the integral IR-LEDs. you can simply unplug the power connector on the rear of the IR-LED Printed Circuit Board (PCB). However, skyking has the newer version of the Foscam FI8904W that has an integral solenoid operated IR filter assembly (IR-CUT) and unplugging the power connector on the rear of the IR-LED PCB disables not only the IR-LEDs but also the IR-CUT unit. The camera’s sensor is sensitive to both visible light and 850nm infrared light. Without an infrared blocking filter between the lens and the sensor, daylight images will not have true colors. But you cannot have a permanently installed infrared blocking filter because then night vision would not work. The IR-CUT solenoid unit enables daylight images to have true colors by blocking infrared. 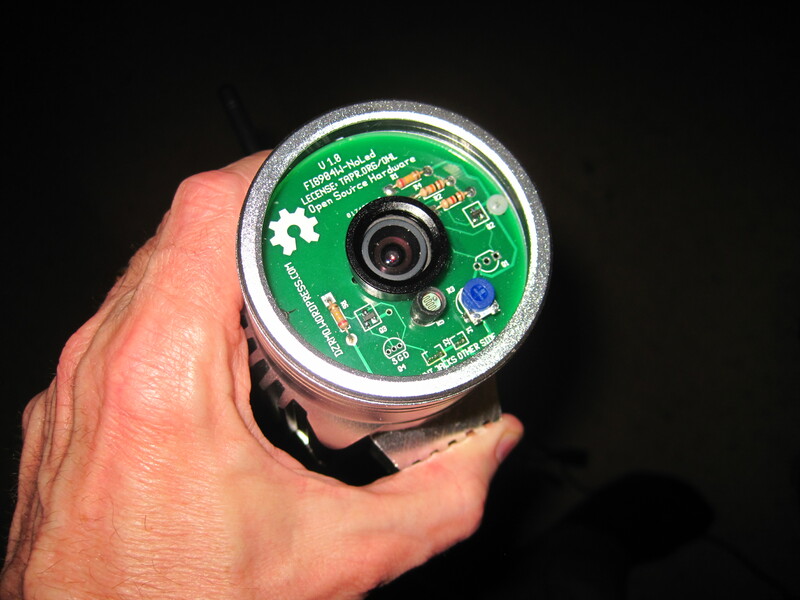 At night, the filter in the IR-CUT assembly is slid away by the solenoid, permitting infrared light through the lens, thus enabling night vision. 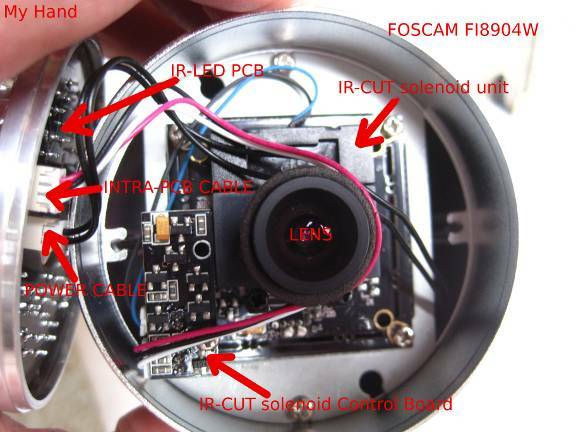 An IR-CUT solenoid unit similar to that used in the Foscam FI8904W is shown in the image below. After some back and forth with SkyKing on the forum, we continued our dialogue via direct email. SkyKing wanted to extinguish the IR-LEDs but he didn’t want to lose the true daylight colors provided by the IR-CUT solenoid unit. This was a problem because the power cable to the IR-LED PCB also feeds the IR-CUT solenoid unit. Unplugging the power connector on the rear of the IR-LED would not only extinguish the IR-LEDs but would also disable the IR-CUT solenoid unit. Skyking’s solution was to cover the IR-LEDs with black electrician’s tape. This is a perfectly reasonable solution but, to me, a more elegant solution would be to replace the IR-LED PCB with a new one that lacked IR LEDs but retained circuitry to control the IR-CUT solenoid unit. Another excuse for me to design and build some printed circuit boards! After some analysis of the existing PCB of the Foscam FI8904W’s IR-LED PCB, including using the pseudo-X-Ray technique described a couple of blog posts back, I created a reverse-engineered schematic of the existing IR-LED PCB. 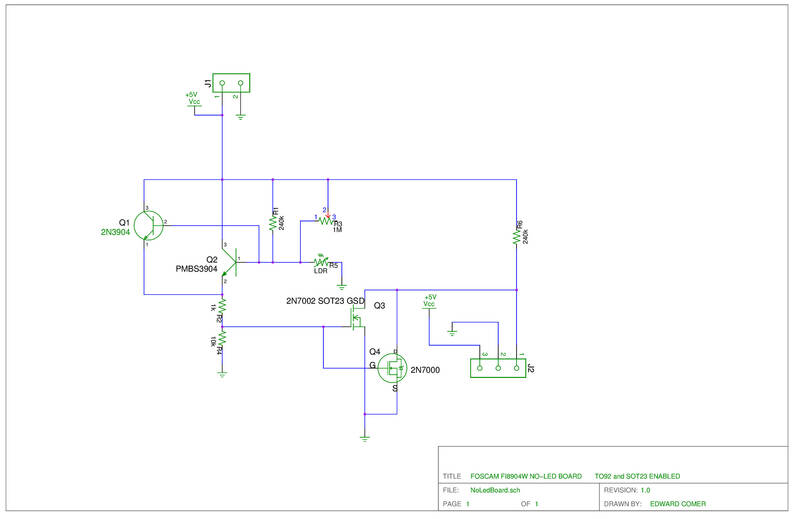 This schematic is available HERE. 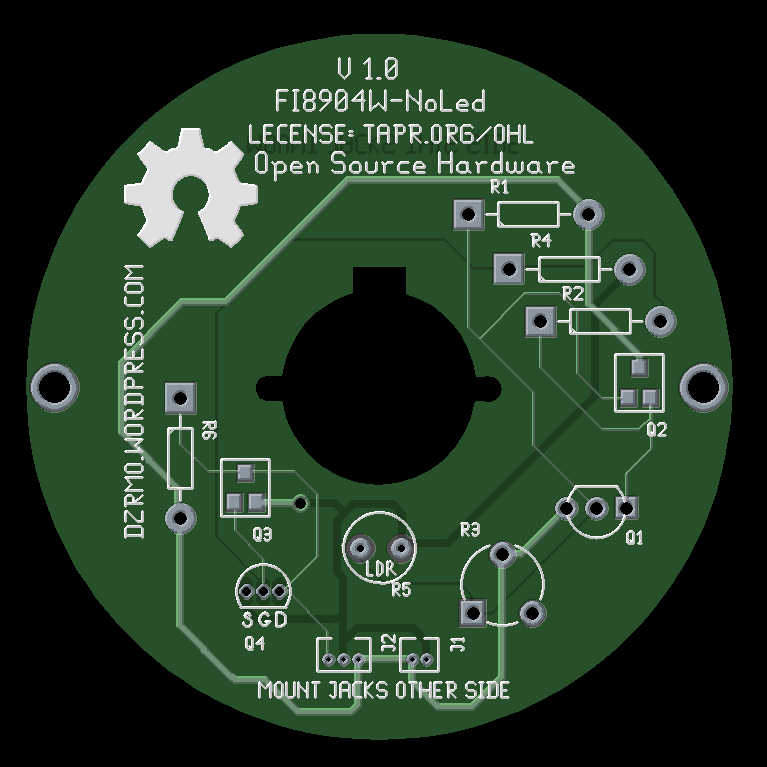 Next, using the excellent open source gEDA PCB printed circuit board design software suite, I designed a new PCB that eliminated the LEDs but retain the IR-CUT solenoid circuit for ambient light detection and control. 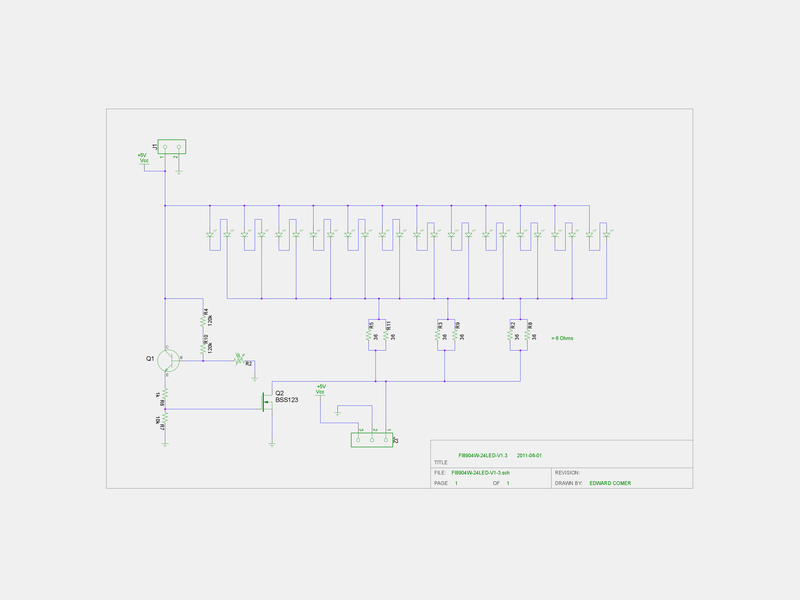 This schematic is available HERE. Since I had never previously worked with surface mounted components, I decided to lay the board out for both surface mounted and through-hole transistors. After assembling several of the boards I can attest that soldering the surface mounted transistors is easier than working with the through-hole version and my future projects will include more surface mounted components. I also layed out one critical resistor to be either an axial resistor or a potentiometer. A pseudo photo of the new PCB board is shown in the image below. One of the critical parts was the Light Dependent Resistor (LDR). While I could have used some GL5549 LDRs that I had on hand, I was lucky and found a seller on eBay that had a LDRs with the perfect characteristics, the GL5528 and it came with the rubber tube and IR blocking filter, just like the original in the Foscam FI8904W. See the image below which is of the Foscam original along with my measurements. The eBay purchase looks identical and functions almost identically. You may wonder about the IR blocking filter in the GL5528 assembly. The reason for it is to make the LDR blind to infrared light. 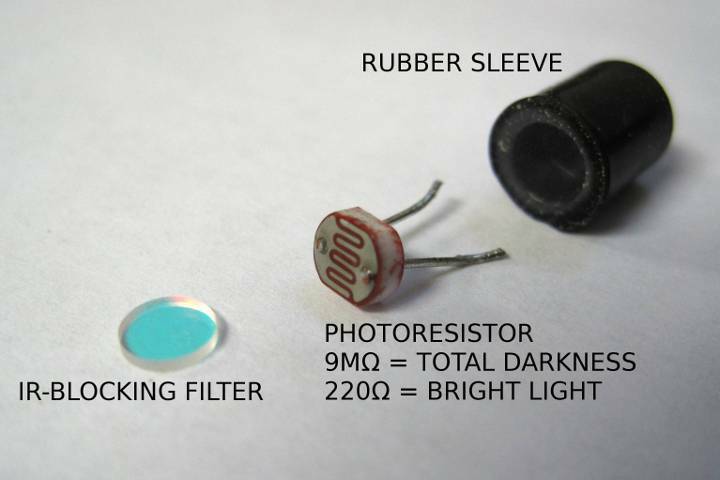 Many LDR devices are sensitive to infrared light in addition to visible light. If the camera were equipped with such a LDR then, when night vision was active, an object moving near the camera might reflect back sufficient infrared light to activate the LDR, putting the camera back into daylight mode. This would be very undesirable. 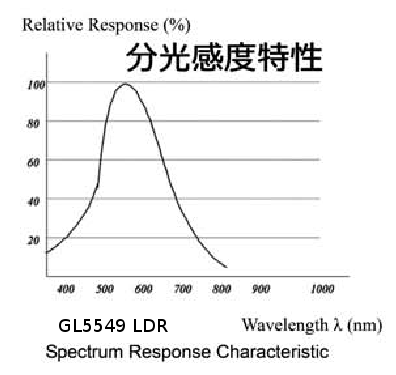 In reality, for either the GL5549 or the GL5528, the filter shouldn’t really be necessary because the GL5528 has negligible infrared sensitivity and the GL5549 has even less sensitivity (see chart below). I suspect that the LDRs used Chinese camera manufacturer may vary based on lots obtained over time and that they use the filter and rubber mount as a precaution. Anyway, I have a bag of the cool little LDR assemblies so why not use them! Before I had PCBs fabricated, I bread-boarded my basic design using a GL5549 LDR. You can watch a short YouTube video of my breadboard test HERE. I had the boards fabricated by two PCB suppliers, one in the USA and one in China. Unfortunately, in the gerber files that I sent to both suppliers, I forgot the mounting holes, seen above, near the left and right edges. So, for these initial boards I had to manually drill the mounting holes. If I ever make additional boards I will correct this. 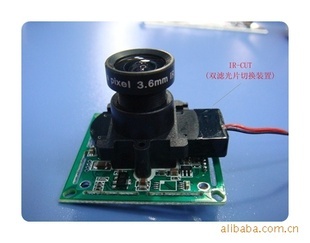 The image below shows the new PCB installed in a Foscam FI8904W camera. This particular board has a potentiometer installed instead of a fixed value axial resistor. This project is Open Hardware sourced and I am willing to share the gEDA PCB design files with anyone interested. Just leave a comment with contact info if you want them (I’ll intercept the comment and it will not be posted, unless you specify that you want it to be posted, so your contact info will be shielded). This entry was posted in Electronics, IP-Camera, security and tagged foscam, ip-camera, IR. Bookmark the permalink. It seems to me that pin 1 of J2 is just a digital IO (I know, big assumption). What would happen if you just pull the 360 ohm resistors from the LEDs and add apull up resistor to pin 1 of J2? Mark, what you suggest would work and I originally considered doing just that. However, my reason in having a PCB that could simply substitute for the original LED board was (1) If the populated boards were to be sold, then a non-technical consumer could accomplish the conversion with just some simple instructions; (2) using the new PCB leaves the original LED board unmodified should an easy, fast and non-technical reversal be desired; (3) to give me an interesting project to undertake. I’ve got, I think, a clone of the FOSCAM and I can switch the IR off using the iPad/iPhone Camviewer App. Would these work in a new Foscam FI8905W it looks just like what I am looking for. I do not have a FI8905W to compare the boards and circuitry – so I cannot say one way or the other. I will reply directly instead of in the comment area. Thicker wires and not using several plugs/sockets along the way may cure it. An excellent solution, very nice work. I too could use one of those boards. Do you have any for sale, populated or otherwise? Hi! Awesome post! The schematic link isn’t working 😦 Is there any chance you could send it? Both schematic links have been repaired. Cool. What other PCBs are stuffed in there? My Foscam fi8906w died out. I thought of putting like a RasberryPi in it. But now I thought of a new idea, maybe I could troubleshoot the power on the PCB. I have considered a new PCB that incorporates an Atmel microcontroller (think Arduino) that is tied to the serial console. I don’t know if it is true for all IPCamera but I can send messages to mine over the Internet via the Comm_write.cgi. The ATmel CPU would monitor the serial console output for messages and then act upon them. Currently, I am just thinking about it – partly because I can’t think of any useful purpose for this. Sorry but I know nothing about your Lorex LW491 cameras. If they were mine I would see if I could open them up and unplug the lights – there is probably a connector inside. Most current model Foscam cameras support manual control of the lights. Hi i would be interesed in the schematics and pcb files . I cooked a Foscam F19803P recently. Any thoughts on where I can get a schematic? I am not aware of any publicly available schematics for any commercial IP-cameras, including Foscam. Hi. I am hoping to implement this mod. Are you able to please email the gEDA PCB file? Thankyou for the great work in preparing the mod! Done – just emailed you the gerbers. Be advised that one mounting hole was so close to a trace that I used a plastic bolt there. I don’t recall if that is fixed in these gerbers or not. I’f you’d like I can send the PCB file. This board has both SMD and through-hole parts as either/or because, at the time, I was transitioning from through-hole to SMD builds. Today I’m 99.8% SMD. P.S. : I’m surprised that you want to do this, unless you have a quantity of old cameras, because current production cameras include LED lighting control in their firmware.